The sea cucumber is an oblong-shaped, gelatinous creature that is distantly related to starfish and sea urchins. The sea cucumber comes by its name honestly: It is indeed shaped like a cucumber. In fact, you could say it has a distinctly phallic appearance, which may account for its reputation as an aphrodisiac. Another distinguishing feature is the tentacles around the creature's mouth, which it uses to take in food. There are hundreds of varieties of sea cucumber found in oceans throughout the world. Depending on where you travel, you'll find it called everything from the romantic sounding beche de mer to the somewhat less attractive sea rat. It is also sometimes referred to as a sea slug, which is somewhat confusing since the real sea slug is another animal entirely. The Chinese name for sea cucumber, hai shen, translates roughly into "sea ginseng." 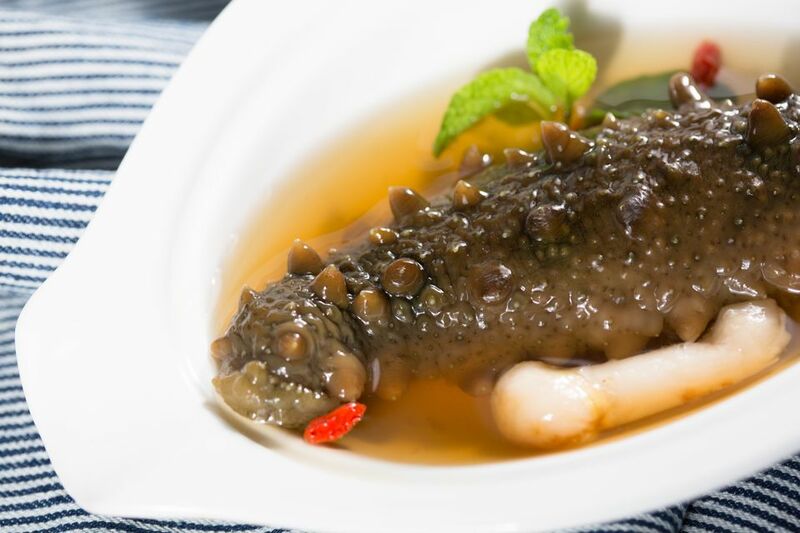 It's unclear whether this is in recognition of the sea cucumber's reputation as an aphrodisiac, or because it is considered to be quite healthful. It may also have something to do with its slippery feel, as the texture of food weighs more heavily in Chinese cooking than other cuisines. In any event, the Chinese have been harvesting sea cucumbers for centuries. One of the more interesting features of the sea cucumber is a self-defense mechanism known as "auto-evisceration." If sufficiently threatened, the animal will rid itself of its gut area. Far from being a bizarre form of aquatic suicide, the animal quickly grows a new digestive track to replace the old one. The sea cucumber has been used in traditional Chinese medicine to treat everything from high blood pressure in humans to joint pain in pot-bellied pigs. When first caught, the sea cucumber requires an extensive amount of preparation before making the transition from the ocean floor to your dinner plate. The complicated procedure takes place over several days and involves slitting open the belly and removing the guts, as well as washing and boiling the animal several times. Fresh sea cucumber that has already been cleaned and soaked is sometimes available in Asian markets, usually in the cold foods section or in containers of water. Many Asian stores also carry dried sea cucumber, which resembles a piece of dried cement (fortunately it's not as heavy). Dried sea cucumber needs to be soaked for several hours before cooking. Like tofu, sea cucumber is flavorless but has the ability to soak up the flavors of foods and seasonings it is cooked with. It is used in soups, stir-fries, and certain braised dishes.